Because these are two relatively young franchises, it’s easy to fall into the trap of thinking of the Jets’ and Predators’ rosters the same way, as playoff ingénues. But Nashville has been here before, seven postseasons in nine years, and has carried over most of the same faces from last year’s Finals run. Winnipeg ... hasn’t. 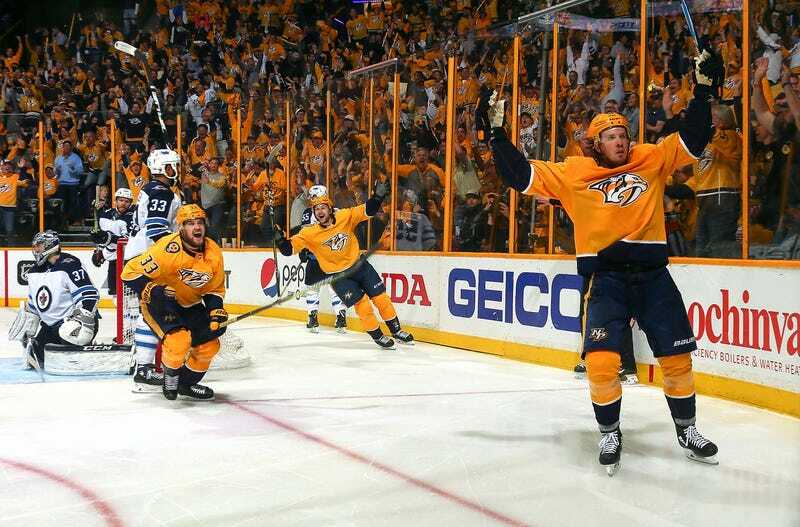 The Predators claim they felt awfully good about their chances as this one went to overtime, and then double overtime, when Craig Smith broke out and fed Kevin Fiala for the winner. It was the culmination of a thrilling, back-and-forth game that the Predators needed desperately, to avoid going down 0-2 with the series shifting to Winnipeg. And it was a hell of a lot of fun. This sort of wide-open play, lots of speed and lots of space for shooters, ultimately played into Nashville’s hands, coming off a Game in which they just couldn’t solve Connor Hellebuyck. Hellebuyck made 47 saves on 48 shots in Game 1, and it’s not a stretch to guess that this series is going to come down to the play of Hellebuyck and Pekka Rinne, Vezina finalists both. On the alternate angle, watch the jumping screen by Viktor Arvidsson in front—one of his signature moves. Much later in the second, Arvidsson found himself in on Hellebuyck all alone, and he did not miss. Despite all the Predators’ shots in Game 1, they didn’t have nearly as many high-probability scoring chances as in Game 2: look how much space Subban, Arvidsson, and Fiala had to work with on their goals. While it obviously went against Winnipeg on Sunday, I’m not so sure this is something they’re eager to address. Allowing counterattacks is an inevitable byproduct of launching attacks, and both the Jets and Predators are so fast and so skilled that taking chances necessarily means letting opponents counterpunch. Throughout the regular season, both Winnipeg and Nashville have generally boasted superior offense and superior goaltending to just about anyone they played. Now they’re each getting a taste of what their doomed opponents have faced. The Jets will have their home crowd back, now, and aren’t about to slow down or play more conservatively, nor should they. This is a series between two superteams with similarly entertaining styles of play. It was always going to be a slugfest.